de l'Institut Ramon Llull et du programme « Culture » de l'Union européenne. Au recto : Maqamat 43: Abû zayd et al-hârith arrivant dans un village. 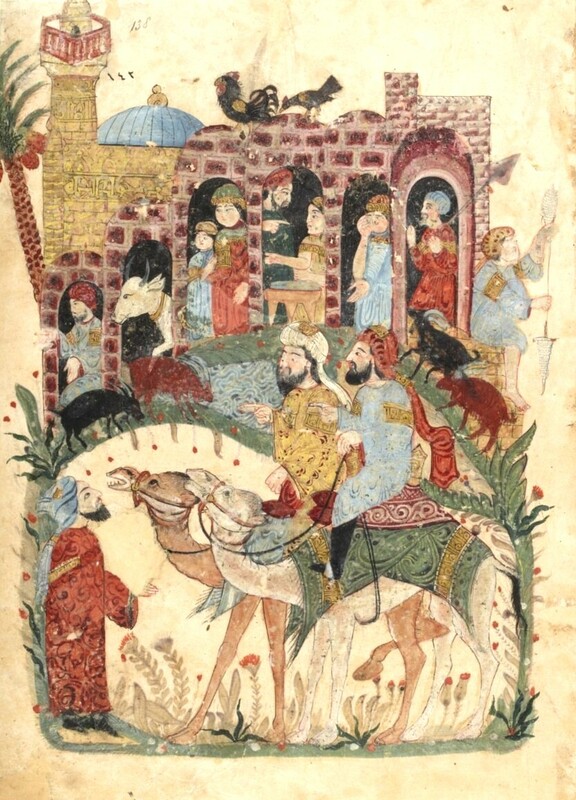 Miniature Arabe du 13e siècle, Bibliothèque National de France, Paris. One of the most tragic flaws of human beings is their great capacity for amnesia, as Milan Kundera reminds us in The Book of Laughter and Forgetting: "The assassination of Allende rapidly eclipsed the memory of the Russian invasion of Bohemia, the bloody massacre in Bangladesh made people forget Allende, the war in the Sinai Desert drowned the cries of Bangladesh, the slaughter in Cambodia made people forget Sinai, and so on and so forth until ultimately everyone completely forgets everything." The first collection of music devoted to the dialogue between East and West began to take shape at the end of 2001 as a search for a spiritual antidote to amnesia and the dramatic and growing clash of civilizations of which so much was made at that point in the War in Afghanistan, which began on 7th October, 2001. It was then that we conceived and carried out our first Music for Peace project, based on "a possible dialogue" between EAST and WEST, in which we invited musicians from Afghanistan and Ken Zuckerman from the United States to take part in a concert on 10th January, 2002, at the Basilica of Santa Maria del Mar in Barcelona. A New Year's concert dedicated to the memory of all the victims of conflicts around the world, it was entitled Músiques per la Pau • Músiques Antigues & Músiques del Món (Music for Peace, Early Music and Music from around the World) and was performed by musicians of the Ensemble Kaboul from Afghanistan, Driss el Maloumi from Morocco and Yair Dalal from Israel, together with the vocal and instrumental soloists of La Capella Reial de Catalunya and Hespérion XXI. We should also remember that just 22 years ago another terrible war began close to our own part of the world with the cruel siege of the city of Sarajevo, in which more than 12,000 people were killed and over 50,000 were severely wounded by Serbian troops. At that time, Europe in particular and the world in general responded with absolute silence and the more than questionable decision not to intervene in the conflict. The result was that the fierce siege of the Bosnian capital continued for another four years (1992-1996). International intervention did not finally come about until 1995, by which time more than 20 thousand tons of missiles and shrapnel had permanently scarred the physical and human geography of the city. With the present dramatic conflict in Syria, the world once again looks on paralyzed and totally impotent as an increasingly sectarian and uncontrolled war reaches ever more unbearable proportions, in which the massacre of innocent bystanders is constantly escalating. Only a few days ago, on 21st August, thousands of women and children (more than 1,300 according to sources representing the opposition to Bashar al-Assad's regime) died of exposure to poison gas. According to the Secretary General of the United Nations, so far 100,000 people have died in the conflict, more than six million children have been caused extreme suffering, 3.1 million young people have been affected by the conflict, another four million people have been displaced within Syria and there are two million refugees in neighbouring countries. Today, everybody is outraged, but words of indignation are no longer enough. Those responsible must be held accountable and the civilized world must demand an immediate cessation of all violent action against the civilian population. Nelson Mandela reminds us that "to be free is not merely to cast off one's chains, but to live in a way that respects and enhances the freedom of others." 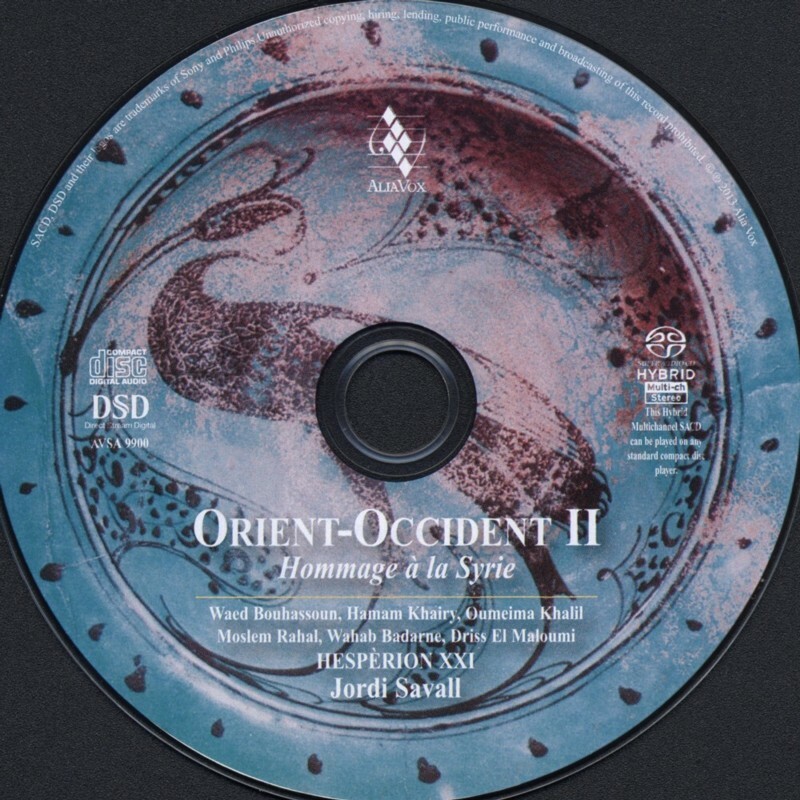 Basically, this second EAST-WEST project was conceived as an act of solidarity to help raise awareness of the dramatic conflict and the terrible war of repression suffered by the Syrian people, sharing musical experience with musicians from Syria and learning about the history of one of the world's most ancient civilizations. The idea became a reality on the occasion of the Christmas Concert Judicii Signum at the end of 2012 in Barcelona, when we were joined by two extraordinary guest musicians from that country: the singer and lutenist Waed Bouhassoun and the flautist (ney) Moslem Rahal. Following on from that remarkable experience, we decided to invite them to take part in a number of projects relating to intercultural dialogue, in particular our Pro Pacem concert in Barcelona on 20th April, 2013, at which we presented the programme from our CD book Pro Pacem: Texts, Art & Music for Peace, in conjunction with Antoni Tàpies, Fatema Mernissi, Edgar Morin, Raimon Panikkar and musicians from all round the Mediterranean. 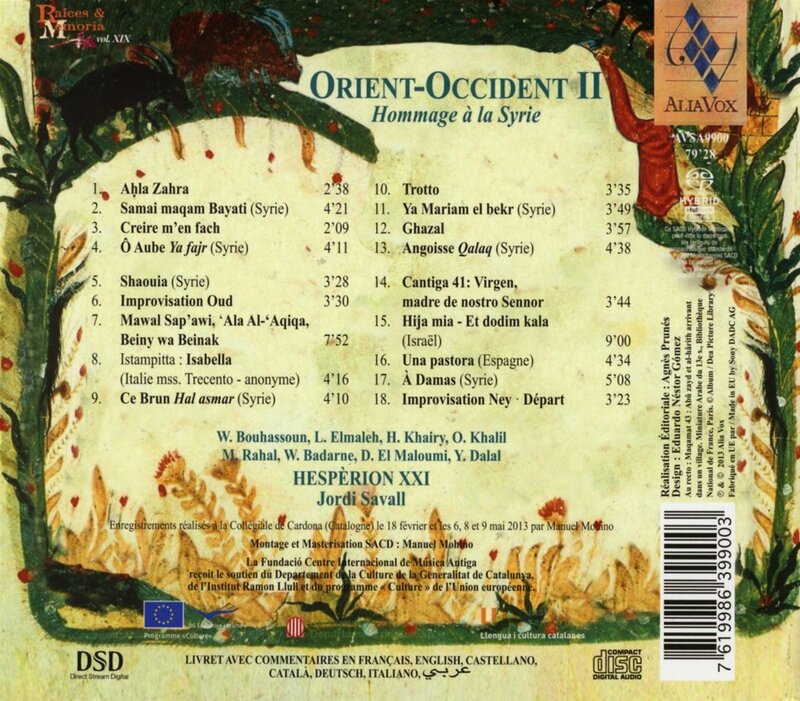 Finally, after months of preparation and working together on various concerts with musicians from Syria, Israel, Turkey, Lebanon, Greece, Morocco and those of the ensemble Hespérion XXI, we have decided to record and release this stimulating new dialogue between musicians from East and West with instruments and music from the old Christian and Jewish Hesperia, the istampitte of medieval Italy, and the songs, improvisations and dances of Syria: ORIENT-OCCIDENT II is a fervent Homage to the Syrian people and, once more, aims to provide a meaningful antidote to the amnesia that diminishes our humanity. The protagonists of this album are musical expressions apparently distant in time and space, music often forgotten beneath successive layers of modernism or undervalued because of its uncertain origins: dances, prayers, songs and laments of rare beauty and intense emotion which, thanks to their buoyancy, also free us from what can be the millstone of our roots and our avoidable isolation. These melodies and rhythms spring from the improvisations on the Oriental ney and our medieval flutes, from the fascinating chants of a mysterious and evocative Islam, from the gentle bowstrokes on the rebab and the steady sound of the Italian lira, from the beats and rhythms of the ouds from Morocco, Istanbul and Israel, from the sparkling notes picked out the Iranian santur and the Turkish kanun... all carried along and encompassed by the ever-present, vibrant, magical pulse of our indispensable ancestral percussions. Thus we have established a genuine intercultural and spiritual dialogue as a vehicle of peace and hope, respecting the musical identity and distinctive culture of "the other": a free dialogue far removed from all fanaticism, all forms of which are always the product of ignorance and absolute conviction. The strength of an idea is not built on convictions alone, but above all thanks to doubt. Graham Greene reminds us that "doubt is essential to faith" and, in the words of Lesley Hazleton "Abolish all doubt and what's left is not faith, but absolute heartless conviction... In short, the arrogance of fundamentalism." As Amin Maalouf says, "If we are to restore some hope to our disoriented humanity, we must go beyond a mere dialogue of cultures and beliefs towards a dialogue of souls. As we stand at the beginning of the 21st century, that is the irreplaceable mission of art." The language of music shows us that this dialogue of souls between musical traditions and musicians of widely differing origins and cultures is possible, because in spite of our religious and cultural differences, we can, through the power of music, rebuild the mental and spiritual bridges destroyed by so many centuries of tragedy, injustice and fanaticism.